The terrorist attack at the Taj Hotel Mumbai was a great shock to all Indians who consider that heritage building as the symbol of our pride against the British racism. I bow my head in prayer for the souls of those who lost their lives during those black days of terror. While I was in the second year of Motion Picture Photography one much needed instrument was an Exposure meter. Unfortunately in those days meters are not available in the market as freely as now. The highly regulated foreign exchange and the heavy customs duty and import restrictions have made it very difficult to obtain one for my use. You have to depend upon friends or relatives coming from abroad to procure one and I didn't have any such persons! Fortunately I had a Pen friend, Mr.Henry G Salomon, who was much older to me and was living in New York and he was about to visit India. So I wrote to him and he had agreed to bring me a Sekonic L-28C Exposure meter. On the arranged date I had to meet him at the then Bombay and collect it. Since I was not much familiar with Bombay city, my classmate Surendra Sahu had agreed to accompany me there and also had arranged for our stay at his friend's place. The day was some time in July - August 1969 and my friend Henry G Salomon and his wife Marilyn were staying at the Taj Mahal Hotel. At the appointed time we met each other - it was the first time that I was meeting them in person as I knew him only through letters. Sahu and myself accompanied them on their sight seeing around the Taj hotel. At last he gave me the Sekonic Exposure meter for which I was looking forward very eagerly. At that time the meter had cost about $30 ( around Rs.210 ) which was reimbursed by my father who met him at Madras later on. My father took them to my family home at Maduranthakam and treated them to lunch and a sight seeing tour of Mahabalipuram. The Sekonic Exposure Meter is still with me in excellent condition and working with out any errors, in spite of the passage of 40 years! We all had a nice dinner together at the Taj during which I had my first taste of delicious lichis. After bidding Goodbye we returned to Sahu's friend's place to stay for the night. I just could not sleep at all because of the stark contrast between the two places - the opulent luxury of the Taj and the dismal atmosphere of a small one room apartment in a chawl! I can never forget the experience of enjoying the cushy comfort of Taj and an hour later, lying on a smelly mat on the ground with mosquitoes for music. Once again I had an opportunity to meet them and enjoy their hospitality at their New York Home. 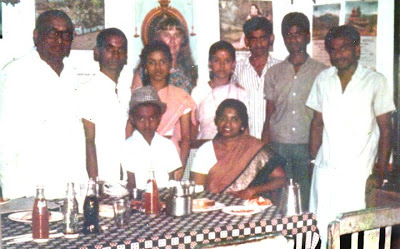 It was in 1978 and I was the Cinematographer for the Malayalam feature film "Ezham Kadalin Akkare" ( Tamil version "Ore vaanam Ore Bhoomi" ) which was being shot in New York and other places. At that time also I was badly in need of some Foreign exchange to buy a still camera and he had graciously lent me some dollars and helped me. All these memories are associated with the Bombay Taj Mahal Hotel. Poor Taj, You have suffered a lot. I hope soon the renovations will restore back your Splendour and Glory .